Welcome Potential New Swimming Pool Customers! 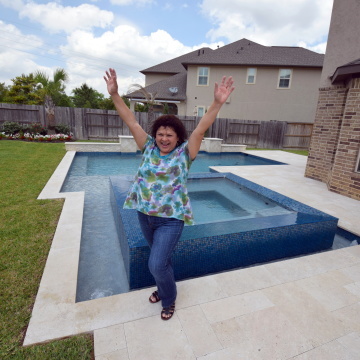 With over 29-Years of custom swimming pool construction experience, U.S. Pool Builder is an expert in designing and constructing high-quality Swimming Pools, as well as total Outdoor Living amenities. U.S. Pool Builder has earned an outstanding reputation as a first-class, hassle-free Swimming Pool Builder, with an excellent online and word-of-mouth reputation. U.S. Pool Builder does not cut corners or compromise quality. We attract and retain the best and most sought-after artisans, in our industry…bar none. Our materials and equipment are top-shelf and are built to last. U.S. Pool builds proactive long-term relationships, by standing behind our products, and being there when customers need help. U.S. Pool Builder also believes in paying it forward and sponsors numerous Jr. High & High School Programs, within our community. U.S. Pool Builder is "Where customers refer their friends"®. I am likely to recommend U.S. Pool Builder to a friend. U.S. Pool Builder left the job site clean. U.S. Pool Builder kept the job site safe throughout my project. U.S. Pool Builder respected my property and belongings. U.S. Pool Builder communicated with me effectively. U.S. Pool Builder effectively addressed and resolved problems. U.S. Pool Builder adhered to our agreed upon schedule. U.S. Pool Builder remained professional throughout my project. The U.S. Pool Builder salesperson was knowledgeable and helpful regarding my project. The U.S. Pool Builder installation crew was organized and professional. Colt Cashner is without peer. His attention to detail is beyond belief and his commitment to providing an exceptional result exceeded our expectations. They did an excellent job and their timeline for doing so was exceptional. They did not fall short of my expectations. There was only one communication issue, but other than that, they were exceptional. I was most satisfied with the timeline. The time from the start of excavation to being done was five weeks, so the starting and finishing time was above average. Mr. Colt did a good job as far as organizing and keeping a good timeline. Our experience with US Pool bulder has been exceptional. The Travertine deck makes these pools really outstanding. We would like to thank Colt Cashner for his excellent design, advice and overall management of the project. He is a great pool builder and excellent person. The very real care for customer satisfaction. Not at this moment, but given the opportunity I will not hesitate to recommend Colt to anyone interests on builiding a Pool. Colt Cashner was the main person from US Pool Builders that we have contact with. 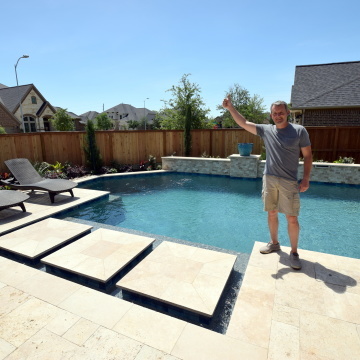 His professionalism and real care for customer satisfaction is I think the main value of this pool builder. Colt was amazing at helping us design our pool. We were overwhelmed with the choices of every detail when we did our own research. But he took the time to ask a lot of questions and assess our needs/goals for the pool, discuss every line item with us, and give us great recommendations. He aimed for us to be happy with the pool when it was done, and we have no regrets. We love the design he chose and the details that really work for us. Excellent communication before, during and after the pool install way exceeded my expectations. I felt like I was their only customer because Colt always promptly responded to my texts/calls/emails at any time. I never felt hesitant to reach out as my questions were always welcomed and answered. Although we ended up spending more than we initially thought, we see the value of every dollar and do not regret even one penny. US Pool built a beautiful, quality pool that will last. Colt was amazing at helping us design our pool. We were overwhelmed with the choices of every detail when we did our own research. But he took the time to ask a lot of questions and assess our needs/goals for the pool, discuss every line item with us, and give us great recommendations. He aimed for us to be happy with the pool when it was done, and we have no regrets. We love the design he chose and the details that really work for us. Excellent communication before, during and after the pool install way exceeded my expectations. I felt like I was their only customer because Colt always promptly responded to my texts/calls/emails at any time. I never felt hesitant to reach out as my questions were always welcomed and answered. Colt always went above and beyond to make sure we were satisfied. Colt is the only one I dealt with, but the service crews were all nice.